Best Uses: Melissa & Doug Jumbo Knob Wooden Puzzle Encourages hand-eye, fine motor and visual perception skills. Best Uses: EASY-TO-GRASP JUMBO KNOB PUZZLE: The Melissa & Doug Large Farm Jumbo Knob Puzzle is an extra-thick farm-themed puzzle featuring bright colors and sweet illustrations of familiar objects., STURDY CONSTRUCTION: This wooden puzzle is made from extra-thick, high-quality wooden materials, with jumbo wooden knobs attached that are sturdy and safe for young hands to grasp., FULL-COLOR PICTURES: Our wooden puzzles for toddlers are designed with full-color, matching pictures that appear underneath each piece. It’s the ideal activity for encouraging visual perception skills and hand-eye coordination., GIFT FOR AGES 12 MONTHS AND UP: This puzzle makes an great gift for kids 12 months and up. Add the Melissa & Doug First Shapes Jumbo Knob Puzzle to round out the hands-on play experience and give kids another engaging option for screen-free fun., “THE GOLD STANDARD IN CHILDHOOD PLAY”: For more than 30 years, Melissa & Doug has created beautifully designed imagination- and creativity-sparking products that NBC News called “the gold standard in early childhood play.”, 100% HAPPINESS GUARANTEE: We design every toy to the highest quality standards, and to nurture minds and hearts. If your child is not inspired, give us a call and we’ll make it right. Our phone number is on every product! Seven favorite farm animals and a farmer stand out against the big red barn. This extra-thick wooden puzzle includes 8 pieces with jumbo wooden knobs that are easy for children to grasp. Full-color matching pictures appear underneath each piece to help with matching. This puzzle encourages the development of hand-eye, fine motor, and visual perception skills. This wooden toddler puzzle is made from extra-thick, high-quality wooden materials, with jumbo wooden knobs attached that are sturdy and safe for young hands to grasp. The puzzle displays cute artwork of sheep as well as a duck, chicken, pig, cow, horse, and farmer. 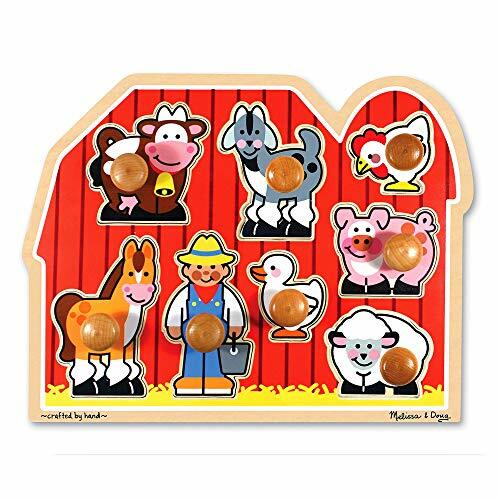 The Large Farm Jumbo Knob puzzle makes an exceptional gift for kids 12 months and up. Add the Melissa & Doug First Shapes Jumbo Knob Puzzle to round out the hands-on play experience and give kids another engaging option for screen-free fun. For more than 30 years, Melissa & Doug has created beautifully designed imagination- and creativity-sparking products that NBC News calls “the gold standard in early childhood play.” We design every toy to the highest quality standards, and to nurture minds and hearts. If your child is not inspired, give us a call and we’ll make it right. Our phone number is on every product!